Everyone at Eight Associates would like to wish you Merry Christmas and a Happy New Year. 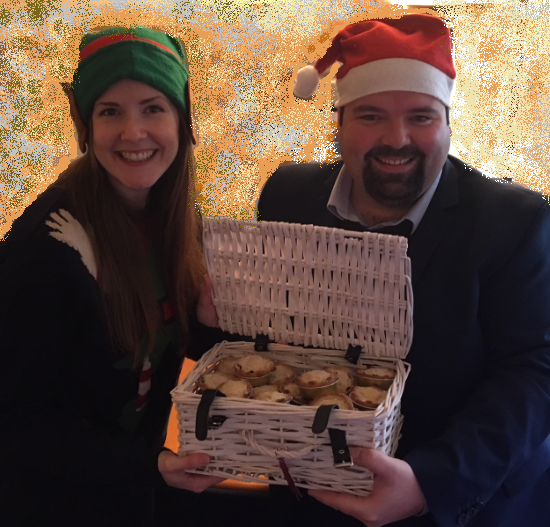 Congratulations to our two prize draw winners: Terry Faulkner, BRE, who won a month’s supply of mince pies, and Phoebe Padley, Matthew Lloyd Architects, who won a Christmas hamper. Enjoy! To have a chance of winning next time, please subscribe to our newsletter. Chris Hocknell, Eight Associates’ Technical Director, presented the hamper to Phoebe, and Becky Armstrong, Lead Sustainability Consultant, delivered the mince pies to Terry. Have a wonderful festive season with friends and family.